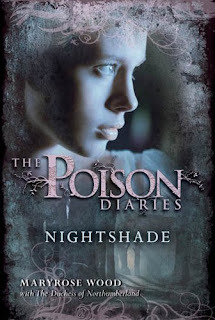 This is the second book in the Poison Diaries Series. The reader will enjoy finding out what happened to Jessamine and Weed. The novel begins innocently enough, Jessamine has recovered from her devastating fever and remains in the cottage with her father, wondering where Weed is and if he truly abandoned her. Weed has been warned away from Jessamine by Jessamine's cold-hearted father. This is the second book in The Poison Diaries series and highly anticipated by many readers. Jessamine wakes up from her extreme illness-an illness she later learns the true cause of- to find that Weed has apparently abandoned her. Weed trudges through the forests, longing for Jessamine, obeying her father's orders to stay away. Not long after her recovery, Jessamine discovers a disturbing fact about her father...one that would explain her mother's rather sudden death as well as Jessamine's random illness. The story takes off from here. Jessamine as a character is interesting. She is hard to hate, though she isn't the nicest at times; she could be considered a sympathetic character after all she has been through with her father, Weed, and angry townsfolk. The reader will have to admit that she is intelligent, brave, and one of those rare strong female characters. Weed, her love interest, is a bit of a conundrum as well. He did leave Jessamine at a vulnerable time-though the act was committed on her father's orders. He has killed-though he admits to the killings and feels very badly about it. Even though Weed could be considered to be "imperfect," that quality is part of his charm. A character need not be perfect to be liked. The secondary characters of this novel play an interestingly large part. Jessamine will develop a second love interest in Weed's absence who will have a huge impact on her life. Weed finds a teacher who is just as eager to be taught by him-she helps him develop his talents and accept them. The events are very fast-paced, the story is told via alternating Weed's and Jessamine's point of views-there is always something going on to occupy the reader. The ending will leave the reader wanting more and excited for the next in the series (oh, please let there be a next)! This book is highly recommended to teen/young adult readers. This book contains twists and many thorns. Jessamine will discover several lurid secrets and Weed will make a final decision regarding his true nature. Several new character are introduced to the reader with the most integral being Rye. Rye will become Jessamine's diversion and possible "special someone." The characters in this novel are dynamic. Jessamine's character develops further, she finds that she might not be "all good." Weed attempts to create a useful talent from his unusual ability with plants. The story alternates as the reader follows first Jessamine's and then Weed's point of view. The secondary characters serve to round out the novel, the reader will enjoy getting to know some of them and prefer not to know some others. The authors' style of writing is incredibly fluid and manages to incorporate many plant allusions and adjectives. The reader will form an easy connection to the likable main characters as well. This book is highly recommended to teens/young adults.